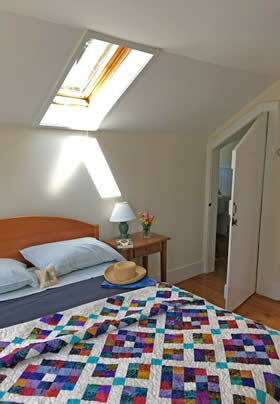 This bright second-floor queen room has the feeling of an artist’s garret with exposed wood, a skylight, and handcrafted décor. 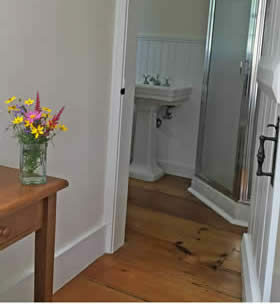 Alice Hurlburt made a home in this house 100 years ago, but guests will also find some Through the Looking Glass inspiration in this colorful B&B space – watch your head stepping through the door to the bathroom. The bathroom has a stall shower with frosted glass door and plenty of shelf space with hooks for clothes. The view looks south to the perennial garden and historic outbuildings.